Is your little boy or girl afraid of the dark? Well those times are over, friend. 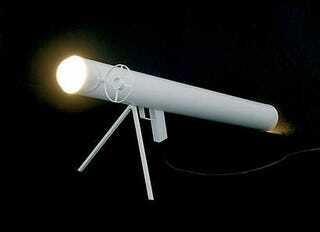 The Bazooka Light (along with the uzi, sniper rifle and pistol) is not some plastic novelty. It's an all-metal lamp—one that will feel like a real gun in your child's hands as he or she puts a stop to the Boogie Man's reign of terror once and for all. Sadly, these lamps are limited edition and probably cost a premium price. But what's the smile of a child worth, their small face beaming in the aura of luminescent weaponry.